Androids are creations that resemble humans in appearance and are able to independently mimic human behavior, but are fabricated from mechanical and/or biologically engineered parts. The most significant difference between humans and androids is that only humans have a human brain. 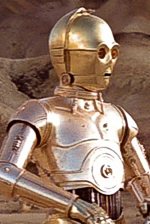 An android with a human brain is more correctly referred to as a cyborg. However not all cyborgs are androids because not all cyborgs resemble humans. Most androids are the product of science fiction. One of the most popular is the character Commander Data ( played by Brent Spiner ) from the science fiction series Star Trek The Next Generation. 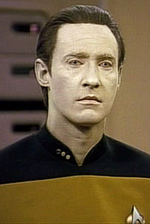 In the episode The Measure Of A Man Data's status as a sentient being is challenged. During the hearing, we are introduced to Webster's 24th Century Dictionary which defines an android as: "An automation made to resemble a human being." In ufology, some MIB exhibit stereotypical android traits such as synthetic looking skin, mechanical like movement and synthesized speech. At the time this entry was last updated, androids engineered and manufactured by humans were very rudimentary, lacking sufficient independent power supplies and CPUs. Cyborgs however, although limited in function, were already a reality because many humans already possessed one or more biomedical implants, among them, teeth, joints, limbs, eye lenses, eardrums, pacemakers, RFID chips, neuro-stabilizers and more. Cyborgs were originally conceived as a fusion of man and machine, the assumption being that the human brain remained intact and in control. 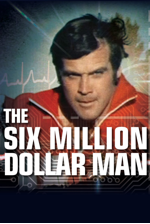 The lead character Steve Austin ( played by actor Lee Majors ) in the fictional 1970s television series Six Million Dollar Man was one of the first widely recognized cyborgs. Over time, fictional cyborgs without an intact human brain became accepted, requiring only that some element of biology be fused with that of the machine. 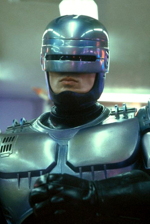 For example, the character Robo Cop ( played by Peter Weller ) from the 1987 film by the same name is a cyborg with only a partial human brain. 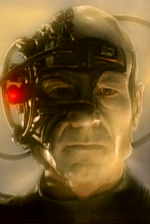 Similarly, in the sci-fi series Star Trek, the race known as the Borg are an eclectic blend of alien species that have been turned into cyborgs. Many borg are not human and yet they are still deemed to be cyborgs because they retain some natural biological function. 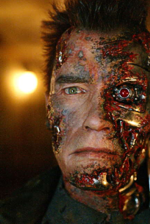 However characters with no human or natural biology have also become accepted cyborgs. The Terminator Model 101, Series 800 ( played by Arnold Schwarzenegger ) from 1984 movie The Terminator has no human brain at all. Instead, the Series 800 is controlled by an artificial neural network in the form of a room-temperature superconducting CPU. Its only biological component is a bio-engineered outer covering for the purpose of mimicking human appearance. Therefore, although the Model 101 can be very loosely defined as a cyborg, it is entirely synthetic and is better defined as an android.